We had a wonderful reaction to this vintage inspired overbust commission recently, though what not many people knew was that this generously curvaceous silhouette was made for a male tightlacer! The finished corset in the Orchid studio, complete with suspenders. This rose quartz coutil corset was created for a long term client, who always selects deliciously dramatic designs and I think this particular one may be my favourite to date. The corset is designed to fit over Priscilla’s padded form, but a sweeping waist reduction is still achieved, creating a silhouette that feels like a classic Victorian illustration of the idealised femme. The dramatic curves of this sculpted corset are perfectly proportioned. Priscilla came to me with a bag full of milkshake-pink hand dyed coutil and images of 1950’s corselettes, intrigued by subtle details such as satinised cups on matte backgrounds and stitch detailing, looking to create a hybrid that incorporated the rosy femininity of the Dior era lingerie with the structure and shaping power of a corset. Detail of cup cording and continuous boning. The corset is made in four layers- a central core of canvas with a fashion layer of spot coutil and herringbone coutil lining, 50 steel bones are fanned through the body, accentuating the contours and curves whilst giving exceptional support. The ballet slipper peach satin cups are corded to enhance the roundness of the bust and the same satin binds the bust and hipline edges. 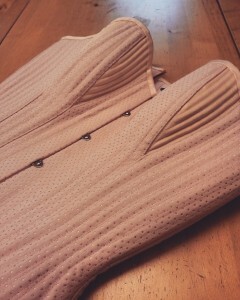 The corset uses a spoon busk front fastening and has 8 removable suspenders in this beautiful rose pink. 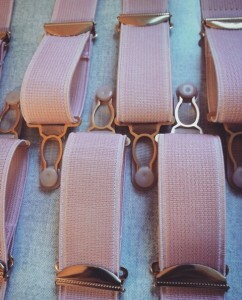 Suspenders made in pink elastic with warm gold fittings. I think a great deal of the charm of this corset lies in the simplicity, letting the drama of the hourglass silhouette take centre stage. This also highlights the construction techniques, with the continuous boning and cording adding texture and catching the light beautifully. Working with this male tightlacer to create a vision of femininity was a real delight, and the end result was even more beautiful than I could have imagined. I hope we have an excuse to make something similarly romantic and resplendent very soon! The perfect shade of pink satin ribbon to lace the corset.